Grits available only during breakfast hours. 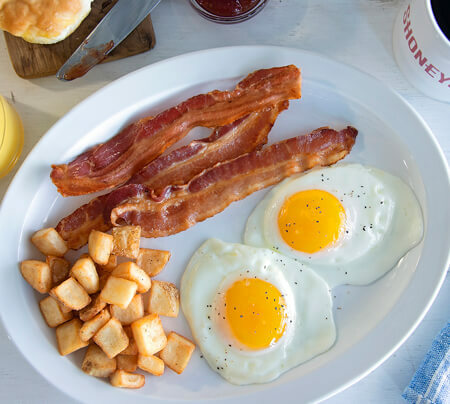 Two freshly-cracked eggs over easy with crispy bacon, breakfast potatoes and a buttermilk biscuit. 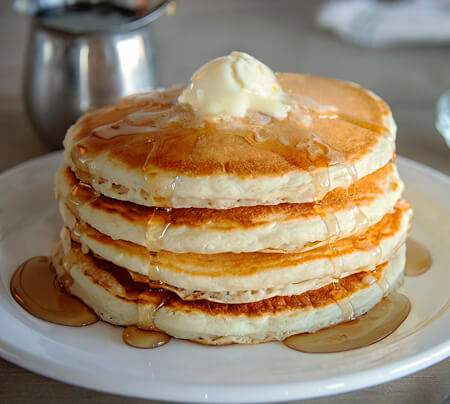 Four pancakes per order. All served fresh. All you can eat. 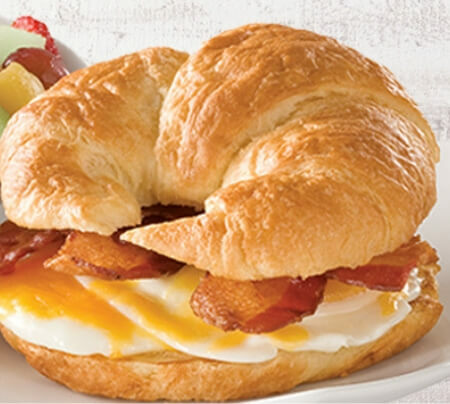 Two freshly-cracked eggs scrambled and served on a toasted croissant with American cheese and crispy bacon. Served with breakfast potatoes. 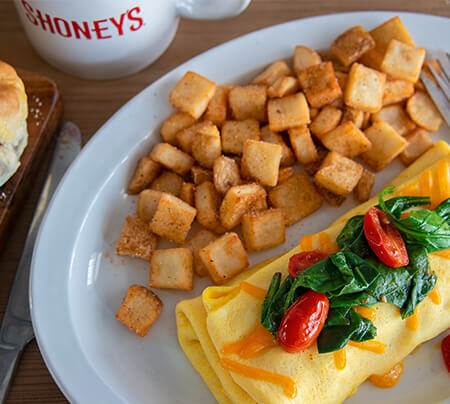 Our delicious Shoney’s® signature, custom-aged 8-oz. top sirloin cooked to order* and available with a buttermilk biscuit and your choice of two freshly-cracked eggs-your-way, your choice of breakfast potatoes, or Southern-style grits. 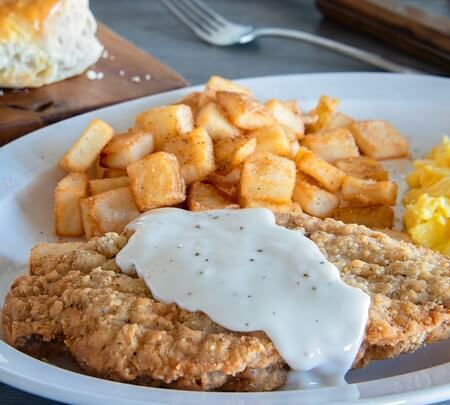 A tender steak coated in our signature seasoned flour, then smothered in our traditional white gravy. Available with buttermilk biscuit and your choice of two freshly-cracked eggs-your-way, your choice of breakfast potatoes, or Southern-style grits. Two buttermilk biscuits served open-faced and smothered in our traditional white gravy. Served with breakfast potatoes or Southern-style grits and a warm buttermilk biscuit. Savory shaved rib-eye grilled with bell peppers, sweet onions and mushrooms smothered in American cheese. Build your own hearty 3-egg omelet by choosing one cheese and three additional toppings from these ingredients: American Cheese, Cheddar Cheese, Ham, Bacon, Sausage, Green Peppers, Onions, Mushrooms, Tomatoes, Spinach. Loaded with onions, bell peppers, mushrooms, tomatoes and cheddar cheese. 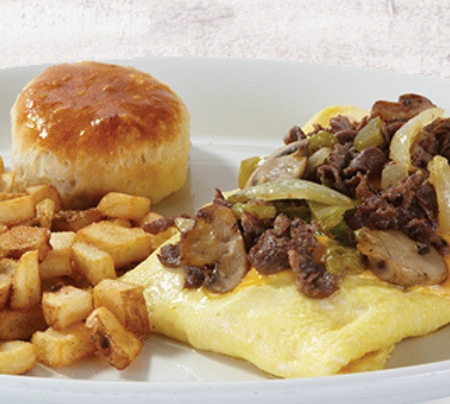 A Shoney's® Signature in an omelet. Loaded with grilled smokehouse ham, tomatoes and melted Swiss cheese.